Several mineral-rich states have demanded a greater say over new mining rules, arguing that foreign firms must not be allowed to grab control of prized natural resources, and are to lobby the Prime Minister. 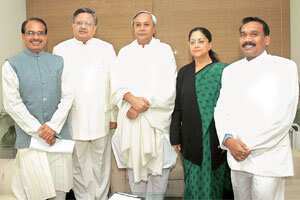 Core issue: (From left ) Chief ministers Shivraj Singh Chauhan (MP), Raman Singh (Chhattisgarh), Navin Patnaik (Orissa), Vasundhara Raje (Rajasthan) and Madhu Koda (Jharkhand) at the Orissa Bhawan to discuss the joint memorandum on minerals. Only 10% of the country’s land mass has been explored for its mineral wealth, and industry officials say that is because paperwork and bureaucratic delays bog down foreign and domestic mining companies trying to unearth resources. The world’s No. 1 steel maker ArcelorMittal, South Korea’s Posco and others are looking to expand or begin operations in India to cash in on huge reserves of key commodities and booming demand. Now the government is exploring ways to hook foreign investment for prospecting and mining. But the chief ministers of Madhya Pradesh, Chhattisgarh, Orissa, Jharkhand, and Rajasthan said on Wednesday that their people should benefit from the minerals beneath their soil. “It is an irony that the mineral-rich states are the poorest states of the country," the chief ministers said in joint memorandum addressed to Prime Minister Manmohan Singh. They argued that a new policy should phase out exports and demanded a greater share of revenues based on royalty. In addition, 5% of profits from mining should be set aside for social and economic development. The memorandum said a draft of a new set of mining regulations being thrashed out by the government was flawed as it offered firms a “seamless transition" from prospecting to mining in a bid to slash red tape. The five chief ministers later met the Prime Minister. Raman Singh, chief minister of Chhattisgarh, said the Prime Minister assured them that their concerns will be reflected in the new mining policy. India is estimated to have 2.92 billion tonnes of bauxite. It is also thought to have 23 billion tonnes of iron ore deposits and 276 billion tonnes of coal.